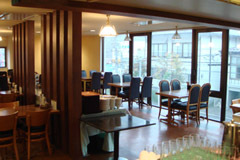 Hotel Tetora is located in the center of Hakodate.It is very suitable for business trip and sightseeing trip. Free parking is avallable for our guests. Vending machine(drinks),coin launderette,Chinese restaurant(2nd floor)Convenience store is next to Hotel Tetora. Parking is free(70cars) You can park before check-in and after check-out. A convenience store(24 hours) is next to Hotel Tetora.